Atopic eczema, also known as dermatitis, is a common inflammatory skin condition. It is most common in children, affecting 20% of children at some stage. Atopic describes conditions such as asthma, eczema and hayfever; which are linked overactive allergic portion of the immune system. Eczema is red, dry, itchy skin which can sometimes become weeping, blistered, crusted, scaling and thickened. The words eczema and dermatitis are used interchangeably by doctors. The reason for patients developing eczema is not fully understood, but as with many diseases there is an underlying genetic risk interacting with environmental factors. The genetic risk factors results in a defective skin barrier, which allows the body to become exposed to normally harmless allergens which create an abnormal inflammatory and allergic response. As there are genetic factors involved; atopic eczema (as well as asthma and hay fever) tends to run in families. It frequently starts early in life, with an itchy rash which can be severe enough to wake patients at night. Atopic eczema can affect skin anywhere. Most commonly affected is the skin in front of the elbows and behind the knees. Atopic eczema tends to cause the skin to become red and dry. It may become moist during a ‘flare and small water blisters may develop especially on the hands and feet. Atopic eczema is frequently diagnosed on examination alone, however occasionally the diagnosis is not clear and a skin biopsy is required to confirm the diagnosis. A number of environmental factors in have been shown to make eczema worse; including heat, dust, wool, even being unwell, for example having a common cold can make eczema flare. Skin Infections with bacteria or viruses can also make eczema worse. As can food allergens, especially in the very young. Unfortunately, it cannot be cured, but there are many ways of controlling it. Most children with atopic eczema improve as they get older (with 60% clear by their teens). Patients whose skin flares often require the use of a topical steroid or calcineurin inhibitors). Application of a moisturiser, washing with a moisturiser instead of soap (known as a soap substitute), and use of a moisturising bath oil are also important. In more severe cases ultraviolet light treatment or systemic therapy (pills) is prescribed. 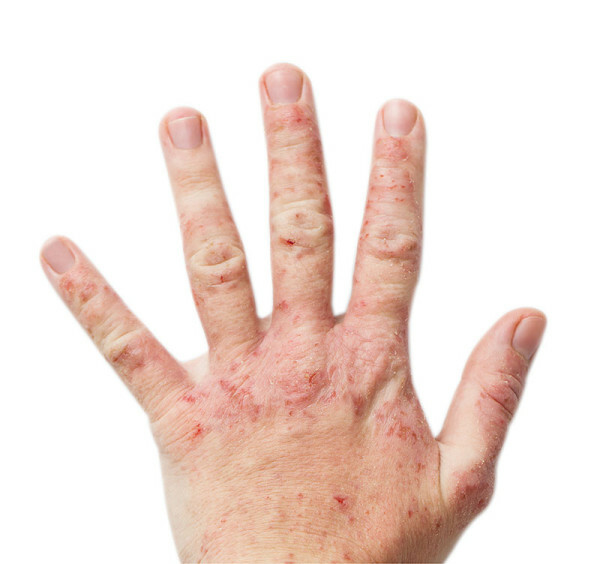 This type of dermatitis is usually due to irritants or allergens, which can be anything– detergents, skin care products, shampoos, rubber, certain types of flowers, perfumes, and jewelry. Contact to any irritant or allergen can cause immediate or gradual symptoms, such as itching and rash. This affects areas of the body covered by hair, particularly the scalp and genital region. It also affects skin folds–sides of the nose or skin under the breasts. Seborrhoeic dermatitis is characterised by greasy, yellowish scaling on affected areas due to overactive sebaceous glands and fungi. In infants, this skin condition is known as cradle cap, which is seen as yellowish patches of greasy, scaly skin on the scalp of babies. Dr Glass diagnoses and treats patients with all types of eczema and dermatitis at his private clinics on Harley Street and across North West London. Click here to schedule an appointment.